The smart medical , Internet of Things technology used in the medical field, and means of networking , digitization, visualization technology , telemedicine , medical wisdom . Xiamen Four-Faith homologues networking wireless communications professional, pragmatic , high-tech enterprises . Before , the four - letter M2M communication terminal , the new smart medical devices applied successfully for telemedicine , mobile care and actively explore. The four - Faith partners - AAA company has been producing for the measurement of weight, height , blood pressure , pulse , and body mass index of electronic medical devices targeted at the high-end . Now launched based on the wisdom of Things new medical products - baby scales . The the product integration infant scales , height measuring instrument to monitor blood pressure and pulse function. 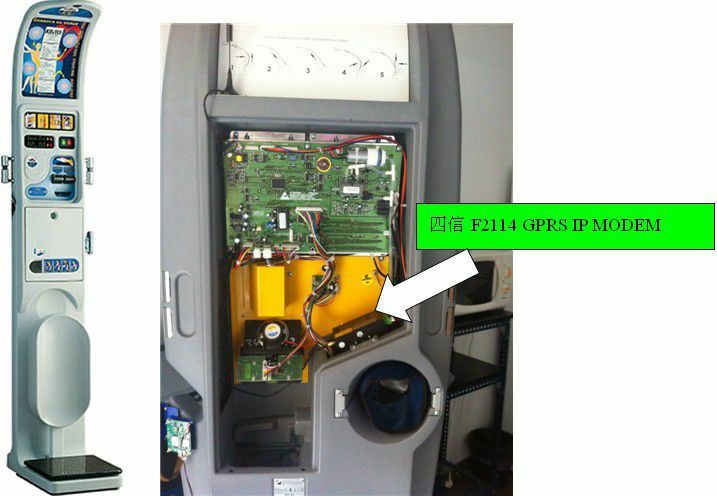 Built- Xiamen Four-Faith F2114 (GPRS IP MODEM), wireless networking equipment and medical centers . Measured by health status data is sent via GPRS to the data center , data center reported data for analysis, storage , tracking . The successful application of Four-Faith M2M wireless communication terminal in the baby said, provides a physical basis for telemedicine, mobile care. The baby said the baby's health information can be recorded in real time, and sent to the four-letter wireless communication terminal behind the medical center, the establishment of personal health records. Care physicians to track the health status of the baby, provide care for the customer to adjust views, the prevention of overweight, the incidence of childhood obesity and other diseases and good defense measures. In the background of the new health care reform, I believe that in the near future, as this combines smart more artificial intelligence, sensing, and wireless transmission of high-tech medical products, will be getting into the lives of ordinary people, for the people body health management bring new models, new applications.